Wynyard Quarter’s residential future has begun. 132 Halsey is a collaboration between Willis Bond & Co and Athfield Architects. Construction is being led by Haydn & Rollett. The Eastern Apartment block now has window installation and fit out underway in the first few Level 1 apartments. Over the next period, Haydn & Rollett will complete window installation to Level 2 and construct the Level 6 floor slab of this block. The Western Apartment block concrete works are also progressing well and over the next period, structural steel of this block will continue to go up. 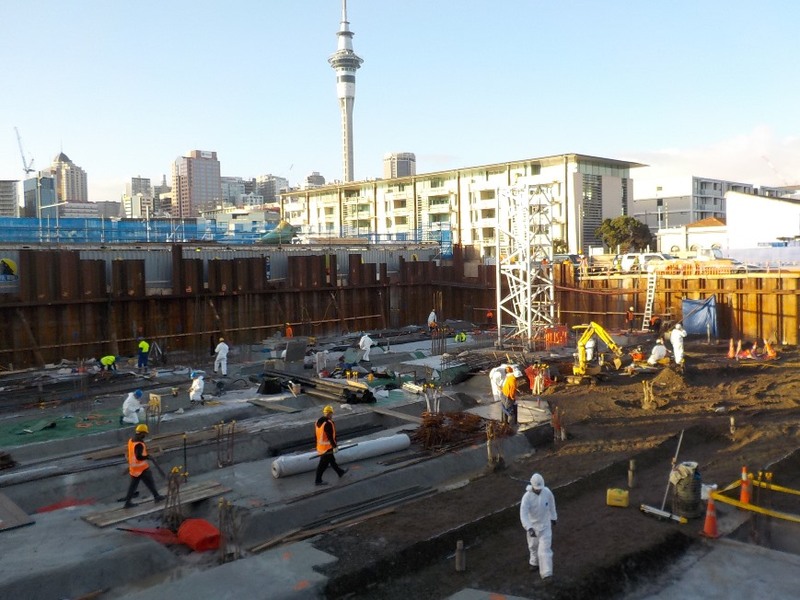 The Eastern Apartment block floor slab is complete to Level 4 with the Level 5 floor slab construction underway. Structural steel installation is commencing up to roof level. The Western Apartment block has commenced window installation at Level 1 with concrete works progressing. The Eastern Apartment block has completed structural steel installation up to Level 6, with ground floor construction now complete. The Western Apartment concrete works are progressing well as timber framing is complete to Level 1 in Core A. Upcoming milestones include completing the Eastern Apartments floor slab to Level 4 and installing the Level 1 windows. 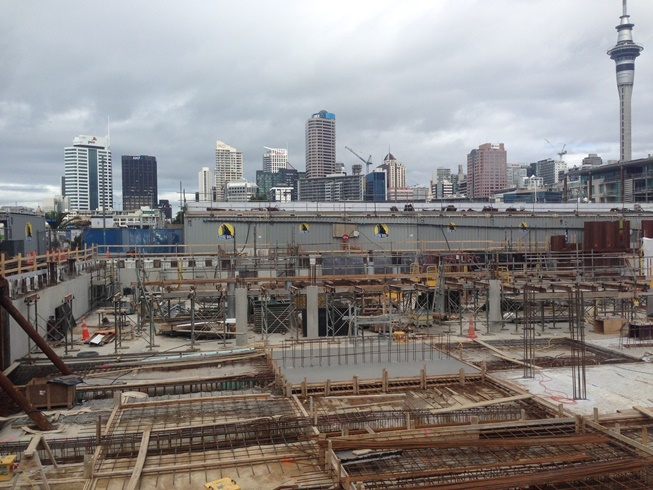 The eastern apartment block has completed installation of floor slabs to level 3. Services are continuing to be installed in the basement. 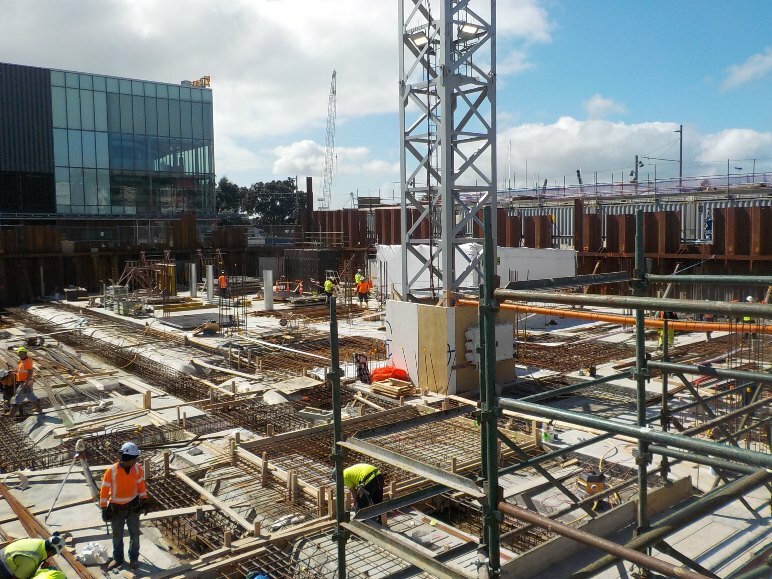 Structural steel to levels 3-6 of the Eastern apartments has commenced. In the coming weeks, the ground floor slabs will be complete. 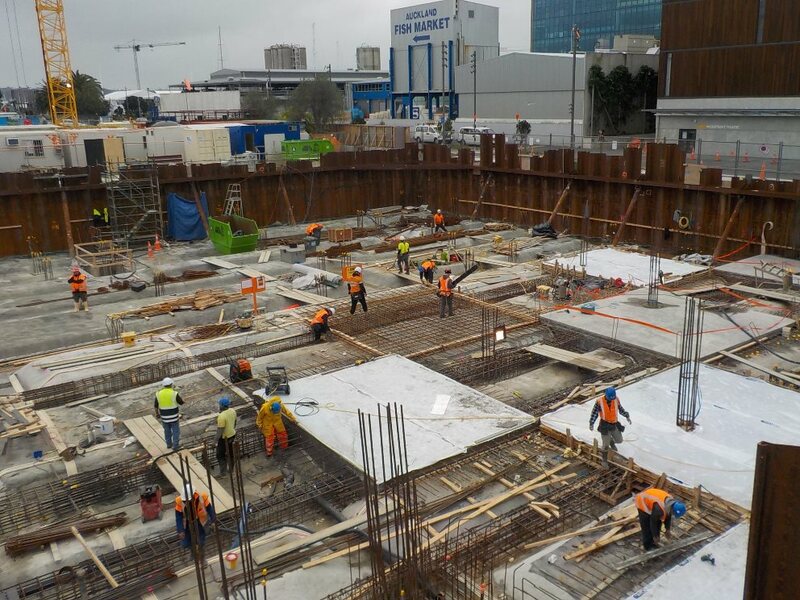 The eastern apartment block level 2 floor slab is complete and the level 3 floor slab is advancing. 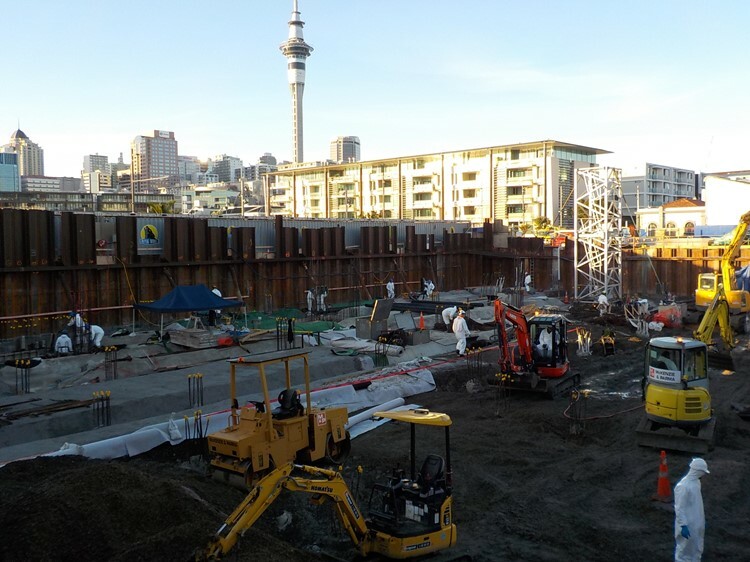 The western apartment block concrete work and wall construction continue to progress. The fire protection of structural steel is due to commence next week. Ground floor construction is complete in zone 3 and service installation is continuing in the basement. Levels two and three of the eastern apartment block are now under construction with the western apartment building due to commence. The final basement wall is presently under construction. 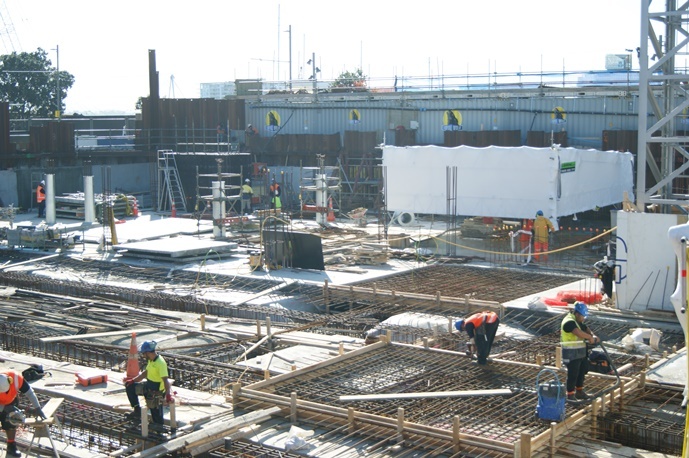 Floor slabs are currently being poured to level 1 and 2 in the Eastern apartment building. Structural steel continues to be erected. Structural steel continues to be installed and is now up to level three of the Eastern apartment block. Floor slabs are being poured at both the ground floor and level 1. In the next fortnight, further structural steel will be installed and the floor slabs will be progressively poured. The structural steel frame has been installed up to level 3 of the Eastern apartment block with concrete walls installed up to Level 1. Preparations are underway to install the ground floor concrete slab. The steel frame of the building is being installed and this marks a milestone achievement for the project. The basement perimeter walls are now complete and the ground floor slab is well advanced. The basement car park construction is underway. 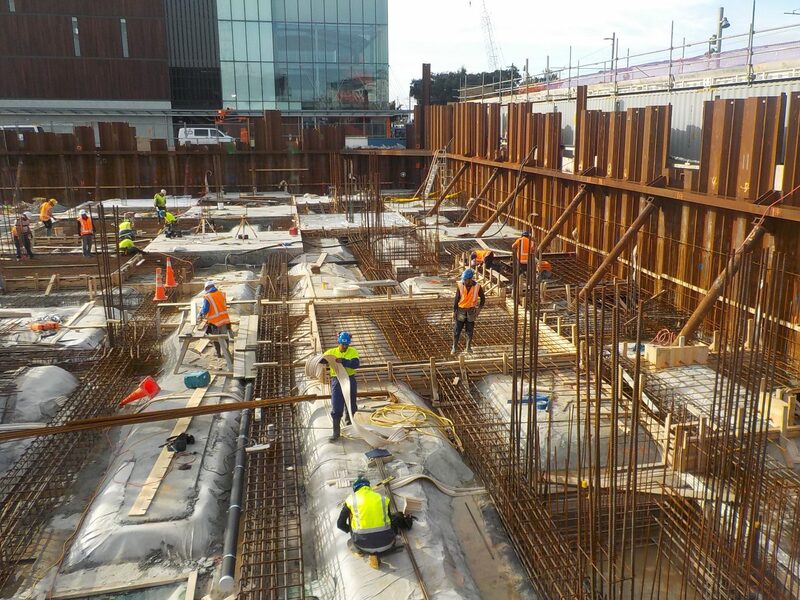 The first section of the ground floor slab in the Eastern apartment block has been poured and 92% of the basement perimeter walls are now complete. 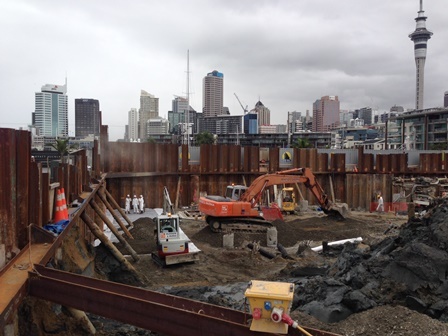 The basement car park construction is ongoing and the structural steel team will commence the Eastern apartment building (above ground construction) shortly. 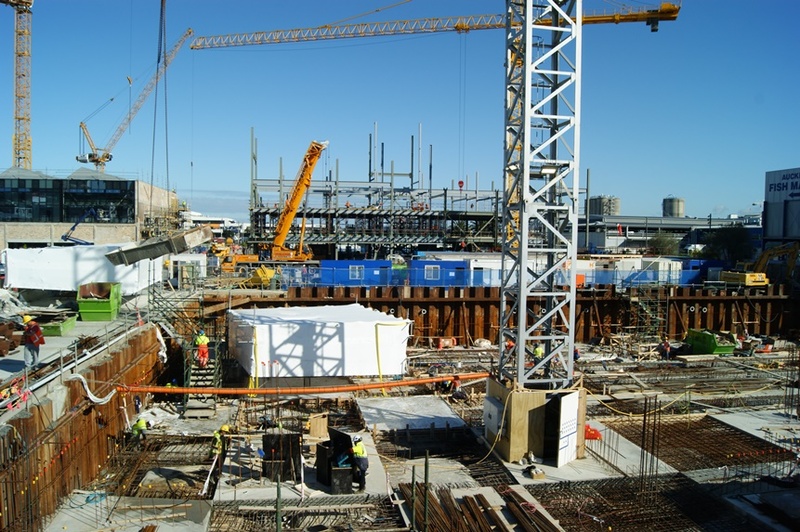 132 Halsey reached a major milestone last week with the completion of the 99th and final basement slab pour. Basement perimeter walls are now well progressed with 75% complete and the main internal basement ramp walls are under construction. 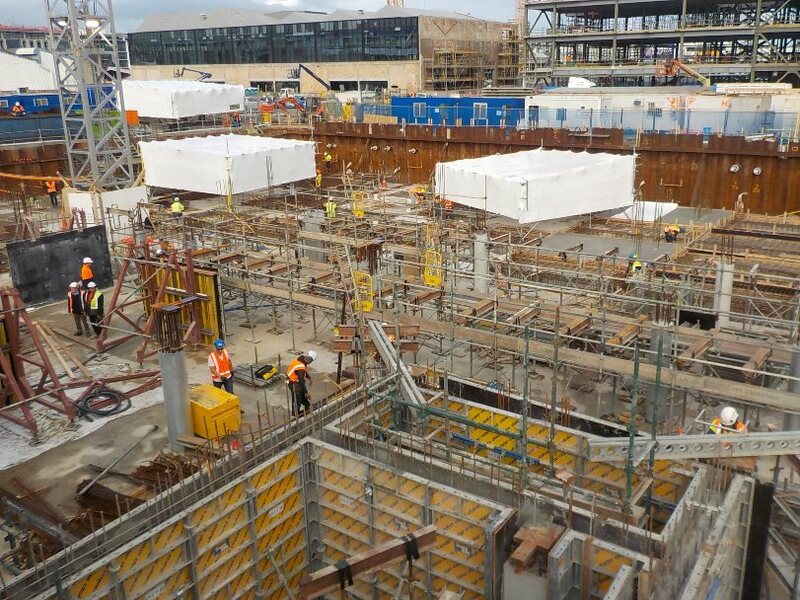 At 132 Halsey, work continues on the construction of the basement structure with the basement slabs now 94% complete and the basement perimeter walls 55% complete. The basement internal walls, columns and beams continue to be constructed and the 132 Halsey tower crane has now been replaced with a larger model. Work continues at 132 Halsey with the basement slabs 85% complete and the basement perimeter walls 45% complete. The basement internal walls and columns are being poured and perimeter capping beam constructed. The tower crane is scheduled for replacement at Labour weekend. 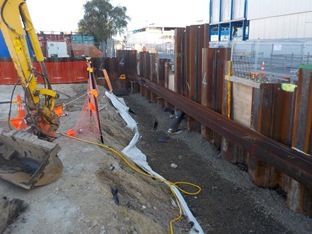 The perimeter capping beam construction has commenced and services installations in the western lane are being backfilled. The basement slabs are now 65% complete and the basement perimeter walls are 35% complete. Basement internal walls and columns are also being poured. The pedestrian gantries on Madden Street are planned to be operational next week, and the tower crane is scheduled for replacement between 21 to 24 October. The basement slabs are now 50% complete and the basement perimeter walls are 30% complete. Basement internal columns are being set up to pour. Starting to remove excess sheet pile lengths and temporary props so that the perimeter capping beam can be built. Services installation in Lane C have commenced. Pedestrian gantries along Madden St are planned to be operational next week. The basement slabs are 40% complete and the perimeter walls 15% complete. 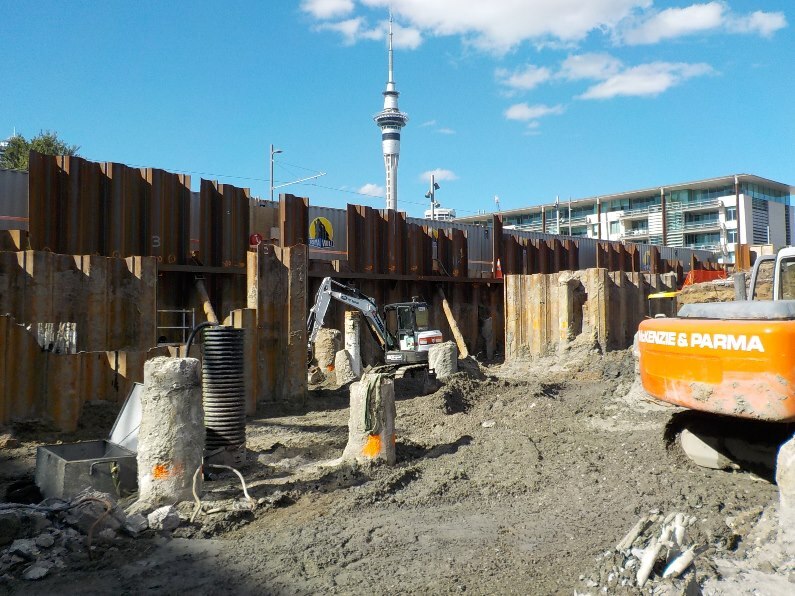 This work will continue next week with the commencement of the internal wall and column construction and the removal of the first sheet piles. The tower crane is scheduled for replacement between 21 - 24 October. Work continues on the basement slabs with 25% of the concrete having now been poured. The first basement perimeter wall has also been poured and the ground beam reinforcing is being installed in the Western zone. Temporary shelters are being used to protect the basement slabs from rain during concrete pours. 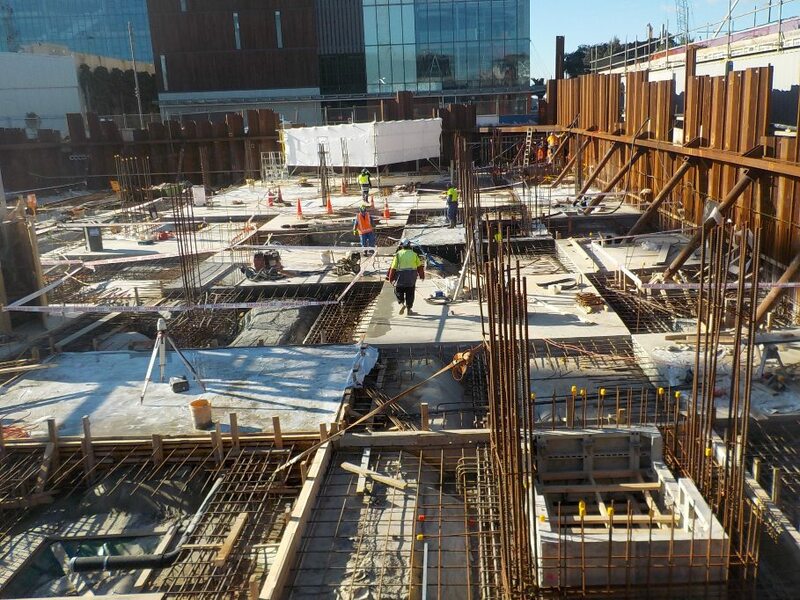 Approximately 20% of the basement slabs have now been completed at 132 Halsey. In addition, the basement perimeter wall construction will be commencing next week. Temporary shelters are being used to protect the basement slabs from rain during concrete pours. The Halsey St pedestrian gantry walkway is now open down the side of the site. Please take care when crossing the vehicle entry to the site and make sure you look both ways before crossing. Work progresses on the basement slabs. Approximately 10% have been poured. The progress being made will continue to be more visible as the building rises from below ground. The tower crane has been erected and is in operation. Final detailed excavations of the basement ground beams are complete and basement slabs are being poured. The progress being made will continue to be more visible as the building rises from below ground. Bulk excavation is now complete. Concrete work to form the sites basement and lift pits is on-going. Ground anchors have been installed. Reinforcing steel is being fixed in the eastern quadrant. Bulk excavation is now complete. Concrete work to form the sites basement and lift pits is on-going. 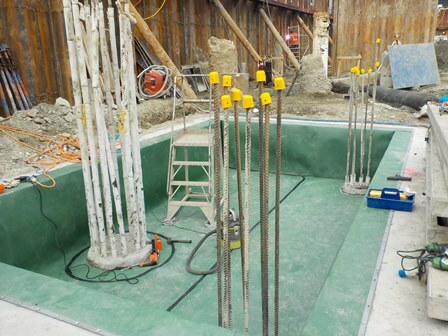 Ground Anchors are being tested in the western half of the site together with further welding of the sheet piles. Bulk excavation within the site is now complete. The installation of ground anchors are being installed in the western half of the site. 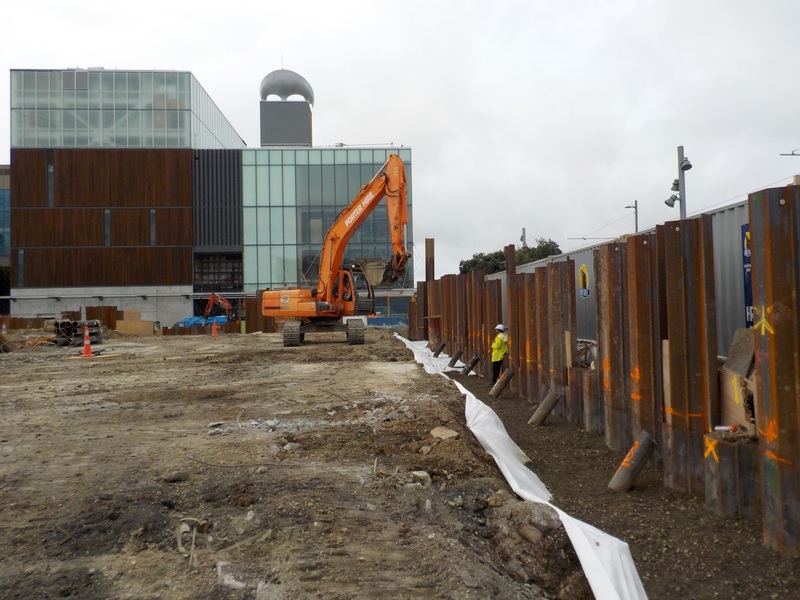 The ground anchors hold back and support the sheet piles which are located around the perimeter of the site. The sites basement level ground beams are currently being shaped and base concrete being poured. The sites tower crane base has been installed ahead of the tower structure and jib arriving to site. The sites tower crane is to be installed end of 25/26 June. Bulk excavation within the site is nearing completion with only the south western corner left to complete. Work to install and test ground anchors which hold back and support the sheet piles continues around the perimeter of the site, as does work on the two lift pits. The sites basement level ground beams are currently being shaped and base concrete being poured. The sites tower crane base has been installed ahead of the tower structure and jib arriving to site. The sites tower crane is to be installed end of mid- June. Platforms have been installed on top of the Halsey Street gantries, thank you for your patience while this work happened over the weekend. Bulk excavation on the eastern side of the site adjacent to Halsey Street is nearing completion. 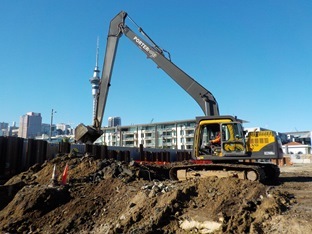 Excavation on the north western part of the site adjacent to Madden Street has commenced. Work to install and test ground anchors which hold back and support the sheet piles continues around the perimeter of the site. Work has commenced on one of the core lift pits. The site will have its first structural concrete pur over the next two weeks. Preparation works for the foundation of the sites tower crane is underway. The sites tower crane is to be installed end of May/ early June. Over the next few weeks excavation will continue over the rest of the site. The sites ground anchors will be install and testing in Madden/ Halsey corner of the site. 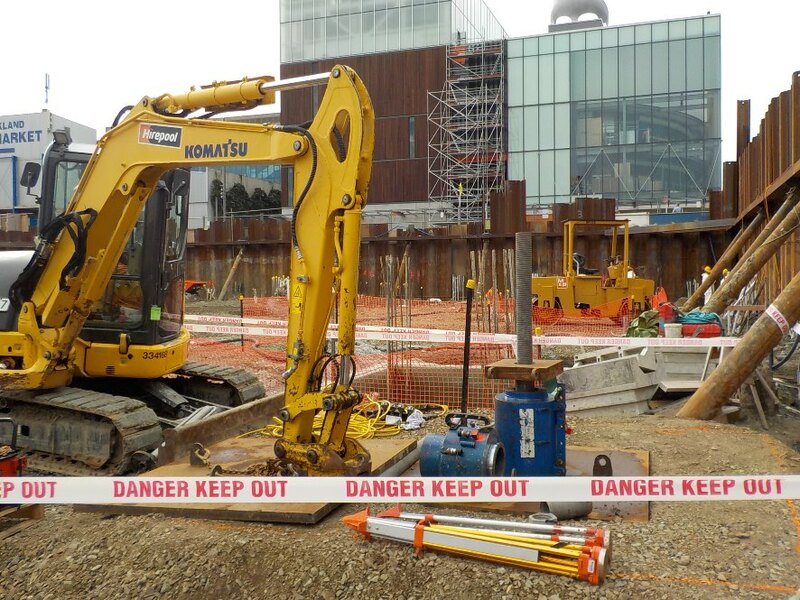 Ground anchors are designed to support structures – it this case the sites perimeter sheet piling. 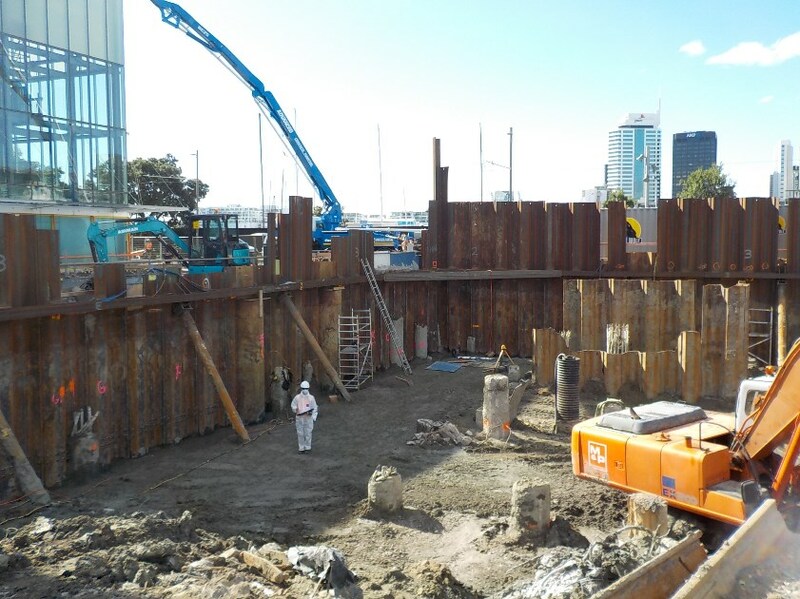 Whaler and gusset installation to sheet piles is ¾ complete. The Whaler beam runs horizontally around the perimeter of the site, below ground level, and is used to support the sheet piles. Gussets are used to connect beams or columns. Bulk excavation has begun at the Halsey/ Madden corner of the site. Excavation in the north east quadrant is intended to be complete by the end of next week, and hardfill will be placed at basement level. Whaler and gusset installation to sheet piles in the south east quadrant is also underway for completion by 17th April. Screw piling is now 100% complete. The excavation of the perimeter of the site is now complete and preparation work for installing the perimeter waler is underway. The waler will be installed to north east quadrant of site this week. The gusset plates will be cut and welded ahead of the screw pile pre-loading. 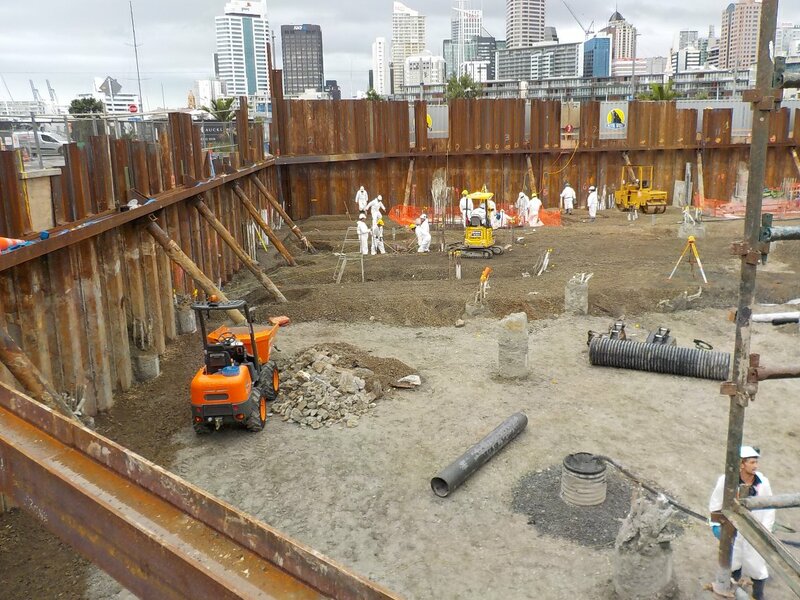 The screw piles will then be preloaded in preparation for bulk excavation in north east quadrant. Bored and sheet piling is now 100% complete. Screw piling is 90% complete. Preparation for excavation has commenced. Screw piling will be completed over the next week. Perimeter excavation within sheet piles for waler installation has started and will continue. Waler fabrication and mobilisation for installation will take place over the upcoming weeks. The piling rigs are starting to be removed from the site now this work has been completed. The excavation crew and associated machinery has started to arrive on site for the next phase of the project. Keep up to date with developments and events with our newsletter. Please fill in the highlighted fields above. Thanks for signing up, look out for our newsletter in your inbox soon!